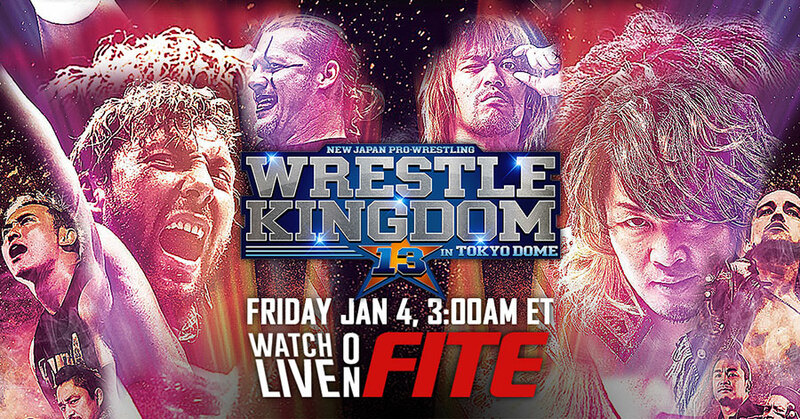 New York City (November 27, 2018): FITE and New Japan Pro Wrestling (NJPW) announced today that their annual event Wrestle Kingdom 13, will stream live worldwide on the FITE digital streaming network from the Tokyo Dome, Tokyo, Japan. Show time for the PPV broadcast is 3:00am ET/12 midnight PT on Friday January 4, 2019. FITE, the world leader in the digital distribution of combat sports, will stream the event live on the www.FITE.TV website, FITE mobile apps for iOS/Android, and the FITE channels of Amazon Fire, Android, Apple TV, and Roku on a PPV basis. The mobile app can be downloaded for free in the iTunes/Google Play app stores. The must see event will be available live worldwide and will be available with English and Japanese commentary. It is priced at $34.99 USD on a PPV basis. Wrestle Kingdom, held on January 4th each year, is the largest event of the year for New Japan Pro Wrestling and is slated to sell out the Tokyo Dome again this year. Wrestle Kingdom is the highest attended pro wrestling event in the world each year, second only to WWE's WrestleMania. FITE is a premium digital live streaming network. With live programming from 250+ partners from over 30 countries, FITE delivers MMA, Professional Wrestling, Boxing, and Kickboxing events live to it's million registered viewers. Since its launch in February 2016, FITE has presented over-1,500 live events and offers over-12,000 hours of video library available to watch on demand. FITE proprietary instant streaming technology allows viewers to seamlessly cast premium live events to connected screens across the world. FITE is available as a mobile app on iOS and Android mobile devices, online at www.FITE.tv and on the Roku, Apple TV, Amazon Fire and Android TV platforms. Formed in 1972, New Japan Pro-Wrestling (NJPW) is the largest pro-wrestling promotion in Japan and second in the world. Known for delivering top-class wrestling matches and a rich history that spans over 46 years, that features over 150 matches a year. A wide range of world-class wrestlers participate in NJPW matches, with a new generation of popular stars including; Kazuchika Okada, Hiroshi Tanahashi, Kenny Omega and Tetsuya Naito amongst numerous others.